Vagator beach is definitely one of those more fancy beaches where plush sea-side restaurants blend with the natural beauty of the cliffed beach. From simple shacks to expensive dining options, you have it all here. We keep frequenting this place, thanks to some of our friends who have made this their favorite haunt. Vagator is divided into two beaches by a small cliff jutting in so don't be confused when you hear people talking about 'Big Vagator' and 'Small Vagator'. The small vagator beach is also known as ozran beach by the way. Like Anjuna, Vagator also sees a lot of trance music being played around but the hippie, bohemian character of anjuna is transformed into a sophisticated one here. The sundowner parties often stretch late into the night or till the wee hours of dawn. Vagator was also the venue for the EDM festival Sunburn, which has now shifted to Pune. If you are not a party animal, just make your way up the little cliff, and enjoy the breath taking views of the sea and sunsets. Though you can drive up to the cliff, you need to climb down a narrow pathway to reach the beach. The beach in this part is good enough for swimming and the sand is soft and almost blackish. From here you can see the Chapora fort sitting majestically on a small hill in the distance. This is a great place for foodies thanks to places like Antares and Thalassa serving continental cuisines as well as local vendors on the street churning up a variety of food from the piping hot maggi (cheese, egg and several other variations) to momos with a host of stuffings and the ever dependable pav with patties and bhajiyas of all types. Well, I can actually devote a whole post to the Vagator food scene I guess! Vagator is blessed with some of the best party venues in north Goa. If you don't want to go too far from the beach then try chronicles beach club, Waters lounge and club, Antares restaurant and beach club or the 9 bar and club. All these places host parties in the weekends and boast great views of the Arabian sea. If you can travel a bit, barely 2kms from the beach is the legendary Hill Top club. All those clubs on the beach, especially chronicles and Antares have a delectable spread of international cuisine. But these will weigh a tad heavy on your pocket. 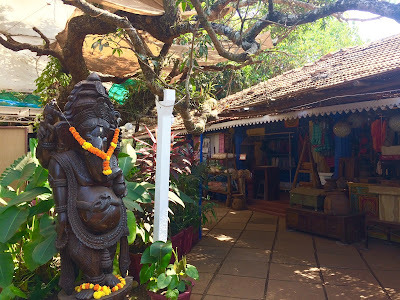 If you want something moderately priced, try the Ganesh juice place near the beach or the Mango tree. These are the ones I have tried out but there are numerous other interesting restaurants and cafes you can try out in Vagator. There are some very good beach view resorts and hotels on the Vagator stretch - ranging from moderately priced to expensive ones. So choose accordingly. However, if you are budgeting, opt for a hotel or resort that is slightly away from the beach. There are a few interesting backpacking hostels too nearby. Vagator beach lies to the north of Goa, around 44 kms from the Dabolim airport and 21 kms from Panjim. P.S: During the off-season/ monsoon season, from June to October, many of the places here including Chronicles and Antares remain closed. They re-open in late October or November. Yeah, Its a beautiful place!